Ethan Bier, chef at Marciano Estate winery in St. Helena, California, cooks his recipe with a fruity extra-virgin olive oil and finishes with the estate’s more robust (and award-winning) Massiglia oil. Any mild white fish—such as halibut, snapper, or grouper—works well here. Roughly slice fennel bulbs into 1-in. pieces. Coarsely chop enough fronds to make 2 tbsp. and set aside. In a large, deep frying pan, heat 1/4 cup olive oil over medium-high heat. Add sliced fennel, shallot, and herbs; season lightly with salt; and cook, stirring occasionally, until translucent, 5 to 10 minutes. Add Pernod and simmer until slightly reduced; then add clam juice, reduce heat, and simmer, covered, until fennel is very tender, 10 to 15 minutes. 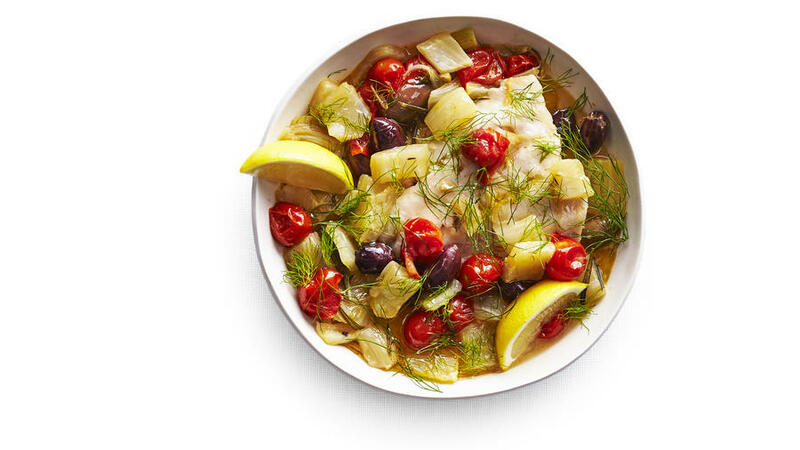 Stir preserved lemon into fennel mixture and top with cherry tomatoes and olives. Lightly salt fish and set on top of vegetables. Cover and simmer gently until fish is just slightly opaque in center, 10 to 15 minutes. Carefully transfer fish and vegetables to a large platter and pour half of pan juices around them. Top with reserved fennel fronds and a drizzle of olive oil. Serve with lemon wedges and the remaining pan juices. *Find preserved lemon at well-stocked grocery stores.